Cinco de Mayo in Style with Burkett Restaurant Equipment! Dust off your margarita pitcher; it’s almost time for Cinco de Mayo! I don’t know a single person that doesn’t enjoy Mexican food and drinks or indulging on the 5th of May, so I’ve compiled a short list of tips to help you celebrate Cinco de Mayo in Burkett Restaurant Equipment style. Is doesn’t take much to set the mood for a fiesta. Hang up your favorite papel picado and get out your Latin inspired table top items for instant ambiance. Throw all ingredients in a blender with crushed ice and blend away to bliss. Don’t forget the margarita rimmer for salt and sugar. Keep it authentic by serving your salsa, queso and guacamole in molcajete bowls or melamine salsa dishes. Surely no Cinco de Mayo celebration can be considered complete without fajitas. Keep your tortillas warm and tasting great in tortilla servers. Finally, set out your Mexican wedding cookies (seriously, they are SO good), turn on the salsa music and shake your maracas into the night, it’s Cinco de Mayo people! Looking for more inspiration? Check out Burkett Restaurant Equipment’s Pinterest page. Deciding which food slicer to purchase for your food service establishment can be confusing. Let Burkett Restaurant Equipment help make it a little easier. Before you shop, do your homework. Commercial slicers make the task of slicing meat, cheese, and other foods fast and easy. They’re typically electric and are used to slice large quantities of food; so knowing what kind of food you plan to slice is just as important as knowing how much food you plan to slice. A slicer’s horsepower is a good indicator of what foods it can handle and how much power is transferred to the blade. 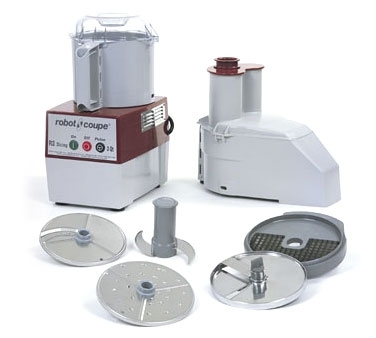 If you need to slice large volumes and require consistent thickness, you will want to look for an electric slicer with a lot of horsepower, allowing you to slice large amounts of meat, cheese, or other foods at one time. While a deli slicer is often equipped with a large blade and can slice limited amounts of cheese, they are not suitable for slicing frozen items. Look for heavy-duty deli slicers that are capable of slicing any amount of meat, cheese or frozen products over a longer duration. Make sure you select a slicer with a blade that fits the product you’re slicing. The volume of food you’re slicing, as well as its size, is a key factor for choosing a slicer. Also, check the size of the carriage, the shelf that holds your meat/cheese in place, to ensure the slicer accommodates your products. Smaller, light-duty slicers equipped with 10-inch blades and are best suited establishments that anticipate using their slicers for only an hour a day. If you’re slicing higher volumes, you’ll require a slicer with a 12- to 14-inch blade. Most heavy-duty commercial slicers are equipped operate automatically, saving your staff from the pushing and pulling your food across the blade. As an added bonus, automatic slicers can be left unattended, allowing your employees to complete other tasks while the slicer works. Manual slicers are labor-intensive, and not recommended for high-volume restaurants and delis. Ready to start shopping? Burkett Restaurant equipment offers slicers made by Berkel, Globe and others.. Despite the wind, rain and bitter cold (yes, it’s still cold in April in Ohio) a team of employees and their families represented Burkett Restaurant Equipment at the annual MS Walk in Toledo this past Sunday. We donned our custom made t-shirts, thanks to our graphic designer Casey, and hit the pavement for a 1-mile, 5-mile, or 10-mile trail. Close to 2500 people participated in the walk this year, held at The University of Toledo. Burkett employees successfully raised $1700 for the event which raises funds to support local programs and cutting –edge research to end MS forever. Ready to Franchise? Read This First! Thinking about franchising your restaurant? While the risks are big, the reward can be enormous. Franchising takes a lot of planning to pull it off successfully. Determining the best time to franchise – while your product is in demand, but not over-saturating the market –can be a daunting task. I can’t help you decide when the time is right, but I can provide you with three things to get the ball rolling if franchising is on your mind. 1. Kick up your marketing. It’s time to focus on the business end of your restaurant. Consider hiring another employee to manage the everyday tasks and focus on building your brand. Broaden your target market beyond local patrons and start thinking about how you want your brand to appear to potential franchisees interested in investing in your company. 2. Get into the weeds. Details people, they make the world go ‘round. In order to franchise your restaurant successfully, you need to design a business model that can be re-produced by multiple franchise owners. In the beginning, each franchise should be operating in an identical manner. (Once your business is established, you can consider regional variations, but we’re not there yet.) Set up standards from food items to napkin designs, this way each franchise adheres to your vision for your brand. 3. Do your homework. Don’t be afraid to ask for help. In fact, I encourage it. You want to make investing in your company easy and worth the effort. Show potential investors that your business has credibility, a proven track record of success, and a recognizable brand. Do your research to determine what other owners with similar business models are offering in terms of loyalties (a 15% ROI seems standard, but what do I really know?). Hire a lawyer to draw up a franchising contract that covers franchise fees, your cut of the revenue, and any other information that you deem pertinent. It’s tough to oversee a large restaurant base without hiring a ton of resources and putting the capital up front. Franchising provides a growth opportunity without those restrictions, since franchisees do most of the “heavy lifting”. With the right planning and conditions, your franchise can be a success. If you’re leaning towards franchising, check out this Essential Checklist and more resources online at www.sba.gov . Aren’t bakeries magical places? It’s like walking into a sugar coated heaven. I can’t bake to save my life, so I’m infinitely impressed by those who can. For those of you that are thinking about monopolizing on your talents and opening a bakery, consider this as your checklist for the must-have equipment. A high quality commercial oven offers baking consistency and reliability. New bakery owners should consider both product and volume when selecting the right oven for your shop. Major bakers looking for power and volume should consider Rack Ovens. These ovens look a lot like a walk-in oven. Rack ovens offer a rotating interior rack for even baking from breads and pastries to meats. Convection ovens are the most common and affordable options for bakeries. Using a fan, convection ovens circulate hot air throughout the oven interior allowing you to bake more evenly and efficiently. Convection ovens are available in both gas and electric options and a range of sizes. The style of mixer you need depends on what you plan to mix and make. Pizzerias or large-volume bakeries will need a floor model mixer, where higher horsepower and larger capacities will help keep large batches of dough under control. For smaller tasks, such as one or two batches of cupcakes or cookies, or occasional light to medium-duty mixing, a counter top mixer will be sufficient. Dough Presses and Dough Sheeters are an essential piece of equipment for bakeries, pizzerias, delis and cafes. Dough Pressers and Sheeters are designed to press large amounts of dough into flat, even sheets for easy preparation and baking. Their consistency and efficiency makes them ideal for pastry, pizza and bread dough. Both counter top and floor models are available to meet your establishment’s needs. Ever been to a sub shop and seen loaves of bread waiting to be baked? They’re in a kitchen essential called a proofing cabinet. If you plan to offer pastries, bread, or other treats that require your dough to rise, you need to purchase a proofing cabinet. Proofboxes range from smaller, under counter units to full size units. We offer them in capacities of 7 to 40 pans to keep your dough at the right moisture and temperature levels. Most proofing cabinets have humidity controls allowing bakers to control the proofing process. Think I missed something? Let me know in the comments! Confession: I’m a hot dog snob. I think it started after reading Upton Sinclair’s The Jungle. In recent years I’ve found myself meticulously reading the ingredients of hot dog packaging, opting for the kosher all-beef franks for our annual summer barbecue. This small obsession of mine, widely known around my family, actually proved worthwhile last month when my mom produced a homemade hot dog recipe from my Grandma’s recipe box. Hot Dogs made from scratch you say? Absolutely. Apparently, not long ago, food was more than just a convenience. It was made to be enjoyed with your friends and family. Don’t scoff, it’s true. My Grandparents owned a farm in Indiana, and I knew they had an extensive garden and made their own wine, but hot dogs? I had to know more. Here’s the thing about deli hot dogs and sausages, the casing is more than likely made from an animal intestine, which doesn’t thrill me. I know, I know, the cardinal rule of hot dog consumption is never ask, “what’s this made of”, so imagine my surprise when I read that my grandma’s recipe doesn’t include intestines or casings at all! 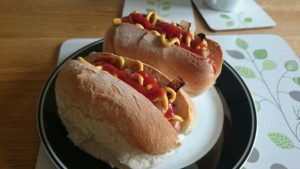 Since hot dog season is upon us, I thought I’d share the recipe with you. I haven’t been adventurous enough to try it yet. When I do, I’ll be sure to update this post. In the meantime, try it for yourself. Don’t forget to check out Burkett’s hot dog equipment and accessories on our website. Mix ground beef with seasonings (salt, sugar, onion, pepper, coriander and nutmeg). Place meat mix and minced bacon in the freezer for about 3 hours, or until semi-frozen. Add meat mix and 1 Cup ice to food processor; combine until blended to a smooth texture. Add bacon to food processor and blend until smooth. Add dry milk to food processor until well-mixed. *The key is to keep your mixture below 50F, keep adding ice between bacon and milk if needed. Otherwise, your mix will break apart, no bueno. Here’s the tricky part: Pull out a good length of plastic wrap and spread the meat evenly along the side seam of the plastic wrap. Roll the meat up in the wrap and use kitchen string to section off the meat every 5 to 6 inches. Refrigerate overnight. Day 2: Bring a pot of water (enough to cover hot dogs by an inch) to a boil, and add STILL WRAPPED hot dogs (it really is a thing, read this L.A. Times article from 2000). Immediately reduce heat to 170F. If you don’t have an instant read thermometer, turn your stove down so the water is just below a simmer. The water shouldn’t be actively bubbling, but rippling. Continue to poach hot dogs until the internal temp is 160F. Drain water off hot dogs and put them in a bowl of ice water for a good 10 minutes. Unwrap and refrigerate until you’re ready to eat! Of course, for precision hot dog cooking, refer to my blog earlier this week Hot Dog Steamers, Rollers, and Broilers: Which is best for you? Hot Dog Steamers, Rollers, Broilers: Which is the Best? Here’s to the hot dog; an American classic synonymous with baseball and summer. With opening week upon us, we’ve decided to take a closer look at the hot dog and the equipment necessary to serve the best sausage around. Whether you’re a hot dog cart veteran or opening your first concession stand, it’s important to know the difference between hot dog steamers, rollers and broilers when you’re choosing your equipment. Hot Dog Steamers are convenient because they are capable of cooking hot dogs and steaming buns simultaneously, producing juicy sausages and fluffy, melt-in-your-mouth buns. Steamers range in capacity from 130-230 hot dogs at a time. Most steamers are Stainless Steel and disassemble easily to make cleaning a snap. Hot Dog Roller Grills are what you’ll typically see at sporting events, gas stations and convenience stores. They’re versatile – allowing you to cook hot dogs, brats, even taquitos – and popular (really, who doesn’t love grilled food?). Rollers spin the hot dogs for even cooking; producing a slightly blackened, crispy hot dog with the snap that New York City dogs are known for. Hot Dog Broilers rely on the temperature of the interior compartment to cook your hot dogs as they rotate around the heat source. Broilers, also known as rotisseries, are available in cradle designs (something like a Ferris Wheel for your sausages) and spikes, where hot dogs are kept on individual spits as they cook. As an added bonus, broilers can cook over 50 hot dogs at once and generally include a bun warming compartment – helping you reduce cost and increase productivity.